About one thousand students have undertaken the post NAC/NAP Midwifery online exams organized by the Nursing and Midwifery Council (N&MC) of Ghana. The online licensing examination is the first to be conducted since the programme was introduced in 2018. 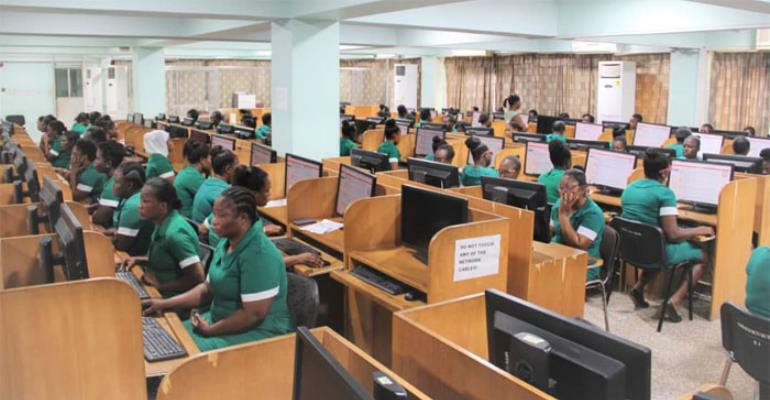 The online licensing examination saw candidates from 22 Nursing and Midwifery training schools taking the examination in thirteen (13) accredited computer labs across the nation. The candidates, after passing the licensing examination will be registered by the N&MC as Registered Midwives. Prior to the conduct of the examination, the Council embarked on a five-day sensitization programme in all schools offering Post NAC/NAP Midwifery training across the nation to educate and create awareness on the online licensing examination for prospective Post NAC/NAP Midwifery candidates. A mock online examination was also conducted to prepare them for the main examination. Mr. Felix Nyante, Registrar of the N&MC said the examination from the onset had been smooth with no record of misconduct. “Since Monday, it has been smooth. We took our time to talk to the candidates and take them through the examination rules,” he said. He disclosed that since the introduction of the online licensing examination in September last year, the Council had used the online platform to conduct the online examination for the Registered Mental Health Nursing, Post Basic and Post NAC/NAP Midwifery candidates. Mr. Nyante noted that the Registered Community Nursing candidates are the next to sit for the online examination in August/September this year followed by the other programmes next year.